Sometimes when I want to give Andrea a gift for her birthday, Christmas, or anniversary -- and I'm in hot water for not remembering such yearly milestones -- I have Ava draw a picture for her. It usually works like a charm, warming the coldest of moods Andrea might be currently riding at the time, no doubt caused by my ineptitude. But this wasn't one of those times. I think. Anyway, in the midst of our anniversary last Saturday, while Andrea was out of the house, I asked Ava to draw a picture that we could give to Mommy. I told her what today meant to Mommy and Daddy, that long (!) ago we got married and that just like how we celebrate our birthdays each year, we also celebrate this special day. She liked that. 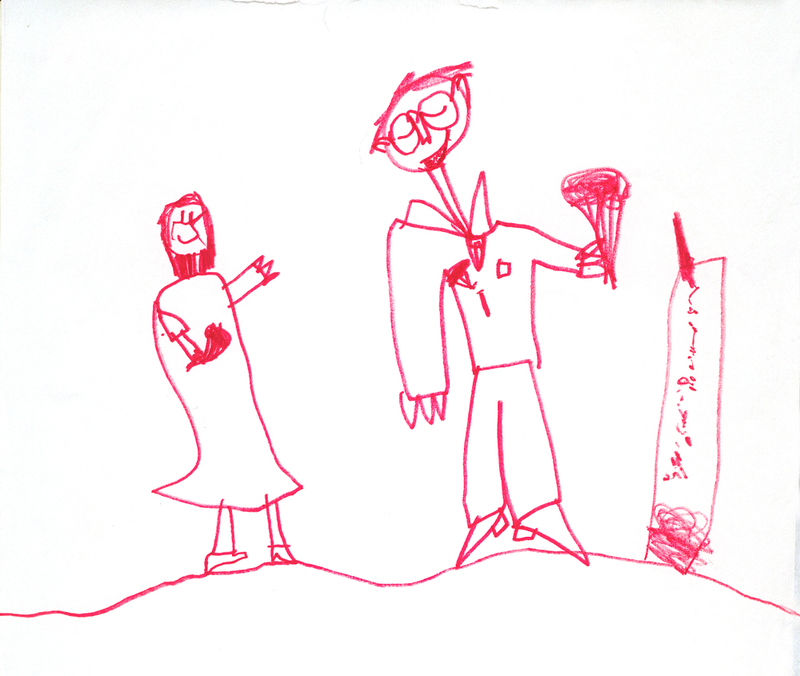 I asked her if she could draw us getting married, as I thought that Mommy would love that. She agreed, and went right to it. She's drawn wedding scenarios before, complete with "the man with the book," who marries the couple featured, but this time she just drew Andrea and I, decked out in dress and suit. In the drawing, I am giving Andrea a bouquet of flowers, even though it seems that she has some flowers of her own. That's a fireplace to the right of us, with a tall chimney. How that fits into our wedding, I don't know and I didn't ask. I like how I look a bit shy, with my meager smile and big glasses. Needless to say, Andrea loved the drawing. I love it, too. I LOVE IT TOO!... and yes, that's how I've always imagined you too. Congrats on the big anniversay milestone! The point is ... your flowers are bigger and better and more expensive than the ones that she bought for herself, therefore, yours are more special, and show how much ... how crazy much you love your wife. That child of yours has keen insight. Actually, Andrea doesn't know anything about this blog. Shhh, don't tell! ....and that drawing is wonderful; it's a kick to see her developing literally every week! Drop me a quick line when you've a chance, W.
Oh my gosh, Ward! I've only seen pictures of you but I swear, Ava's got you down pat. Her drawing really looks like you! what took me was your face ward. she did an amazing sideways face drawing. everything seems to be in in proportion. nice drawing to have. i'm sure andrea adored this. AH!!! Happy Anniversary! I'm sure this drawing was very well received! It's so lovely. I like how Andrea seems to be saying "Hey Ward, Over here with that big bouquet!" and your about to sweetly turn around and hand them to her. Very nice. I particularly like your face and shoes in this drawing. Ava has got it goin' on! Kids are sweet. :) Cute drawing! yes, best anniversary present EVER. AND-- you think I don't know what you're doing when you give me precious ava art when you've messed up? I don't care. I love you anyway.